Cork City Council has issued a warning about flooding in low lying areas. Flooding at Salthill & Monkstown Dart Station. POWERFUL SPRING TIDES are affecting coastal areas leading authorities to suspend trains and issue warnings. 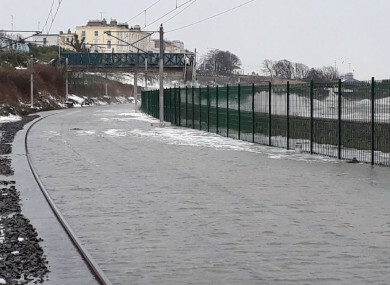 A tidal surge flooded the tracks at the Salthill & Monkstown Dart station in Dublin and led to the cancellation of Dart services between Pearse Station and Bray. Irish Rail provided alternative buses for rail customers on the affected route. RTE’s Barry Lenihan tweeted video footage of the flooding. Earlier today Dún Laoghaire harbour closed public access to both the East and West piers as waves were crashing over the top of the piers. Following a warning yesterday Cork City Council said there still remains a risk of tidal flooding in parts of the city. It is expected that the main impact of the flooding will be confined to traffic movement and parking in the lowest lying areas. The council is advising residents and businesses to monitor developments and take precautions. All public transport in Ireland has now been suspended as the country braces for adverse weather conditions from Storm Emma and the Beast from the East to worsen. A status Red warning is in place for the entire country for today and tomorrow. Services are expected to resume on Saturday but no decision will be made until tomorrow. Email “Tidal surge shuts down Dart in Dublin and sparks warnings in Cork”. Feedback on “Tidal surge shuts down Dart in Dublin and sparks warnings in Cork”.